Diamond Flake… yes… the famous Citizen Diamond Flake (DF) had two younger brothers, the Diamond Flake Date (DFD) and the Flake Date (FD). The older, well known brother held the record of the worlds thinnest three hands watch, with a a movement as thin as 2.75 mm. Now, that is slim indeed! Citizen named this calibre 0700 and had 25 jewels and was gold plated. All three of them are made of stainless steel and are powered by the same base manual wind movement. The crystal is acrylic and the dial is simple and elegant for all of them. 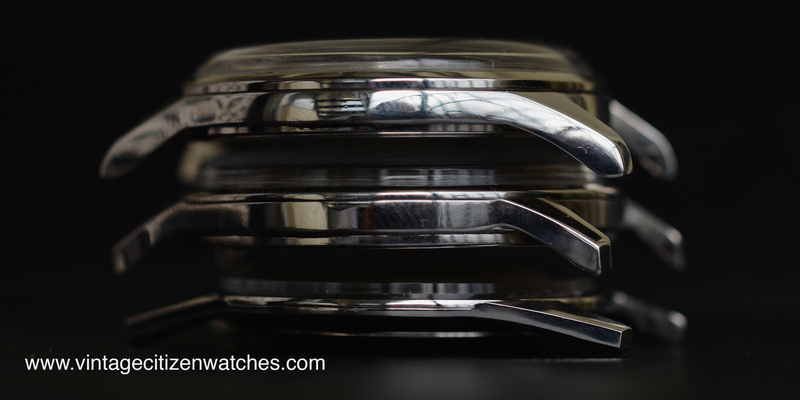 Obviously the DFD and FD have a date complication that adds some thickness to the overall appearance of the watch. This can be easily seen in the picture below. The shape of the lugs and the lugs width are also different. The crowns are similar and are not signed. On top of the added date, the youngest of the three are also marked Parawater for 40m. The case backs give clear indication to their age: 1963, 1964, 1966. 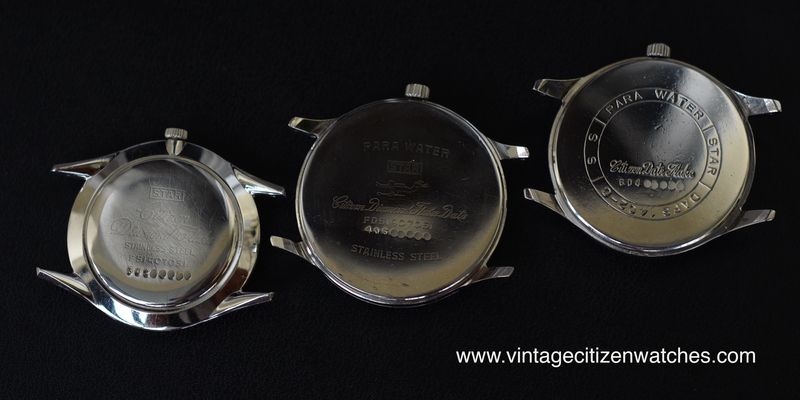 The middle one had a beautiful diver engraving (the Parawater logo, not an indication that you should take it diving). 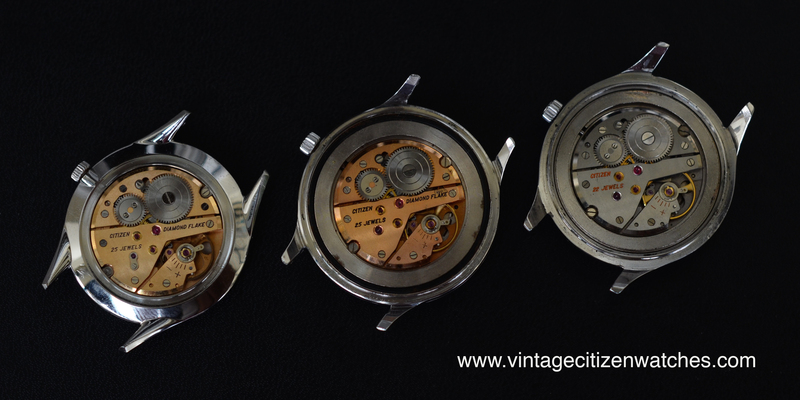 The movements look almost identical but the third one is no longer gold plated and it only has 22 jewels. The first one is Citizen calibre 0700, the second calibre 2700 while the last one is the calibre 2710 and it is no longer marked Diamond Flake. They all run at 18,000 bph. 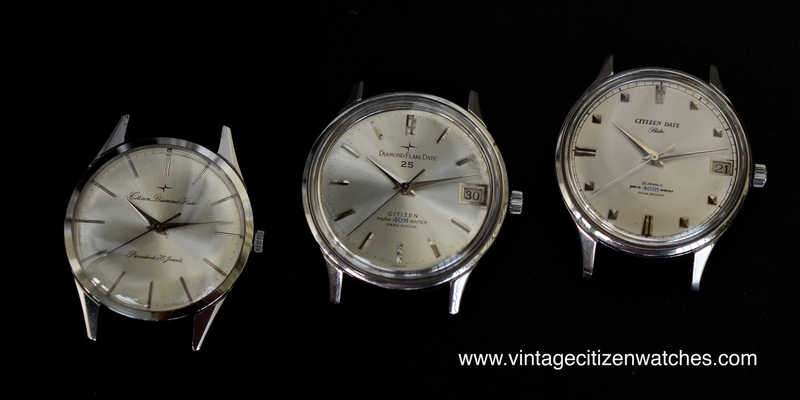 All three are beautiful watches, simple and elegant and a nice addition to any Citizen collection. Even though the DF is the famous one, the youngest two (DFD and FD) are more rare and more difficult to find in a good condition. If you want to read more about the oldest one, the DF, click HERE. This entry was posted in Citizen date, Citizen history and data, hand winding, parashock, vintage Citizen and tagged citiden flake date, citizen cal 0700, citizen calibre 0701, citizen calibre 2010, citizen calibre 2700, citizen diamond flake, citizen diamond flake date, diamond flake, diamond flake date, elegant watch, flake date, para 40m water, parawater, suit watch, thin watch, worlds thinnest watch. Bookmark the permalink. Hey I have a citizen 21 jewels watch 6n 4w s, 4 a02092 ac, 30603274 could you tell me more about it please. tried to make sense of the movement table but failed miserably. Hello David! Is it possible for you to post a few picture? Just upload to http://www.tinypic.com and add the links here. Thank you for the pictures, it seems it is a rather common watch, not really vintage, made in June 1983. Read this to see how to date a Citizen: https://vintagecitizenwatches.com/2014/02/23/dating-a-vintage-citizen-watch/ It is powered by Citizen automatic calibre 8200 Miyota.